CHRISTCHURCH, New Zealand (AP) Google is launching Internet-beaming antennas into the stratosphere aboard giant, jellyfish-shaped balloons with the lofty goal of getting the entire planet online. 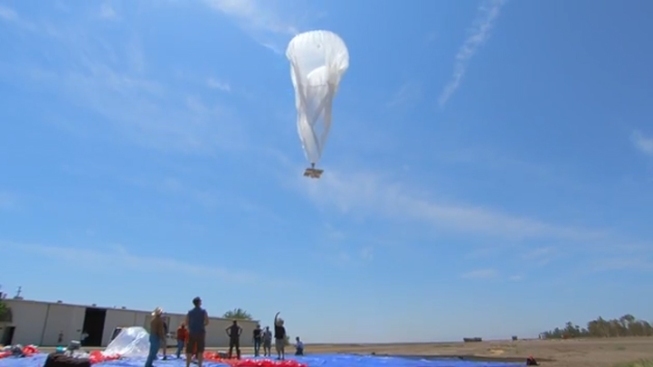 VIDEO: Google introduces "Project Loon"
The so-called Project Loon was developed in the clandestine Google X lab that also came up with a driverless car and Google's Web-surfing eyeglasses. Google would not say how much it is investing in the project or how much customers will be charged when it is up and running. The first person to get Google Balloon Internet access this week was Charles Nimmo, a farmer and entrepreneur in the small town of Leeston who signed up for the experiment. Technicians attached a bright red, basketball-size receiver resembling a giant Google map pin to the outside of his home. In a successful preliminary test, Nimmo received the Internet for about 15 minutes before the 49-foot-wide transmitting balloon he was relying on floated out of range. The first thing he did was check the weather forecast because he wanted to find out if it was a good time for "crutching'' his sheep, or removing the wool around their rear ends. Nimmo is among the many rural folk, even in developed countries, who can't get broadband access. After ditching his dial-up four years ago in favor of satellite Internet service, he has gotten stuck with bills that sometimes exceed $1,000 a month. In recent years, military and aeronautical researchers have used tethered balloons to beam Internet signals back to bases on Earth. Google's balloons would be untethered and out of sight, strung out in a line around the globe. They would ride the winds around the world while Google ground controllers adjusted their altitude to keep them moving along the desired route. Ground stations about 60 miles apart would bounce Internet signals up to the balloons. The signals would hop backward from one balloon to the next to keep people continuously connected. Solar panels attached to the inflatables would generate electricity to power the Internet circuit boards, radios and antennas, as well as the onboard flight-control equipment. Each balloon would provide Internet service for an area twice the size of New York City, or about 780 square miles, and because of their high altitude, rugged terrain is not a problem. The balloons could even beam the Internet into Afghanistan's steep and winding Khyber Pass. ``Whole segments of the population would reap enormous benefits, from social inclusion to educational and economic opportunities,'' said DePauw University media studies professor Kevin Howley. In the U.S., however, Google would have to notify the Federal Aviation Administration when the balloons are on their way up or down. The company is talking with regulators in other countries about meeting their requirements. The Internet signals travel in the unlicensed spectrum, which means Google doesn't have to go through the onerous regulatory processes required for Internet providers using wireless communications networks or satellites. At this stage, the company is putting a few dozen balloons up over New Zealand and then bringing them down after a short period. Later this year, Google hopes to have as many as 300 of them circling the globe continuously along the 40th parallel, on a path that takes them over New Zealand, Australia, Chile and Argentina. Covering the whole world would require thousands of the balloons. No timetable has been set for that. Google chose New Zealand in part because of its remoteness. Some Christchurch residents were cut off from the Internet for weeks after a 2011 earthquake that killed 185 people. Google said balloon access could help places suffering natural disasters get back online quickly. Already the world's largest advertising network, Google stands to expand its own empire by bringing the Internet to more corners of the Earth. More users means more potential Google searchers, which in turn translates into more chances for the company to display ads. Richard Bennett, a fellow with the nonprofit Information Technology and Innovation Foundation, was skeptical of the project, noting that smartphones are increasingly being used in developing countries. "I'm really glad that Google is doing this kind of speculative research,'' he said. "But it remains to be seen how practical any of these things are.'' Before heading to New Zealand, Google spent a few months secretly launching two to five flights a week in California's Central Valley. "People were calling in reports about UFOs,'' DeVaul said.